It only makes sense to ask the user the standard “Are you sure?” question. If you missed the first two articles, they are here and here. Here’s more details about the parameters. Do note that the GUID presented is the GUID of the Dialog we’ll be launching, the “lead” is the entity it acts upon, and the FirstPrimaryItemId is the id of the Lead we’re executing against. this function is quite self explanatory, and the same format applies for any Dialog you want to call, as you define the Dialog GUID outside of the function. Thanks to Mark for making this function more streamlined than the version I came up with I kept the same values for window size, but you can change those as needed. You might want to revisit the reload form line at the end if you are going to change the Owner of the Lead. I prefer to close the window completely after this. 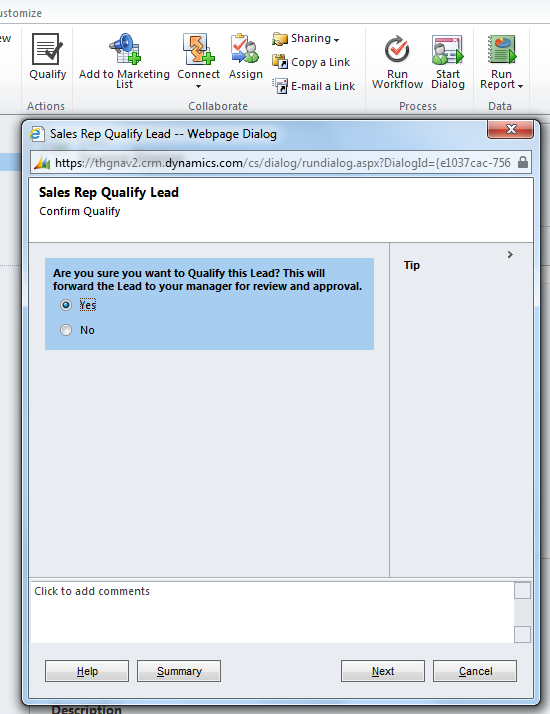 Now from within that dialog you can put your own logic and call other Dialogs or Workflows. Sky is the limit!